The Death of General Sir Ralph Abercromby, K.B. Francis Legat (1755-1809). Artist associated with 1 portrait. Thomas Stothard (1755-1834), Painter and illustrator. Artist associated with 34 portraits, Sitter in 14 portraits. Sir John Abercromby (1772-1817), General. Sitter in 4 portraits. Sir Ralph Abercromby (1734-1801), General. Sitter in 15 portraits. Robert Anstruther (1768-1809), General. Sitter in 4 portraits. Colonel Birch (active 1801), Soldier; present at Battle of Alexandria 1801. Sitter in 4 portraits. Richard Ford William Lambart, 7th Earl of Cavan (1763-1836), General. Sitter in 2 portraits. John Hely-Hutchinson, 2nd Earl of Donoughmore (1757-1832), General and politician. Sitter associated with 8 portraits. John Francis Caradoc (Cradock), 1st Baron Howden (1762-1839), General. Sitter in 6 portraits. Sir James Kempt (1764-1854), Governor-General of Canada. Sitter in 8 portraits. George James Ludlow, 3rd Earl Ludlow (1758-1842), General. Sitter in 5 portraits. Sir John Moore (1761-1809), Lieutenant-General; victor of Corunna. Sitter in 11 portraits. Sir Hildebrand Oakes (1754-1822), Lieutenant-General. Sitter in 5 portraits. Sir William Sidney Smith (1764-1840), Admiral. Sitter in 23 portraits. James Stirling (active 1774-died 1825), Major-General. Sitter in 2 portraits. Sir John Stuart (1761-1815), Lieutenant-General. Sitter in 6 portraits. 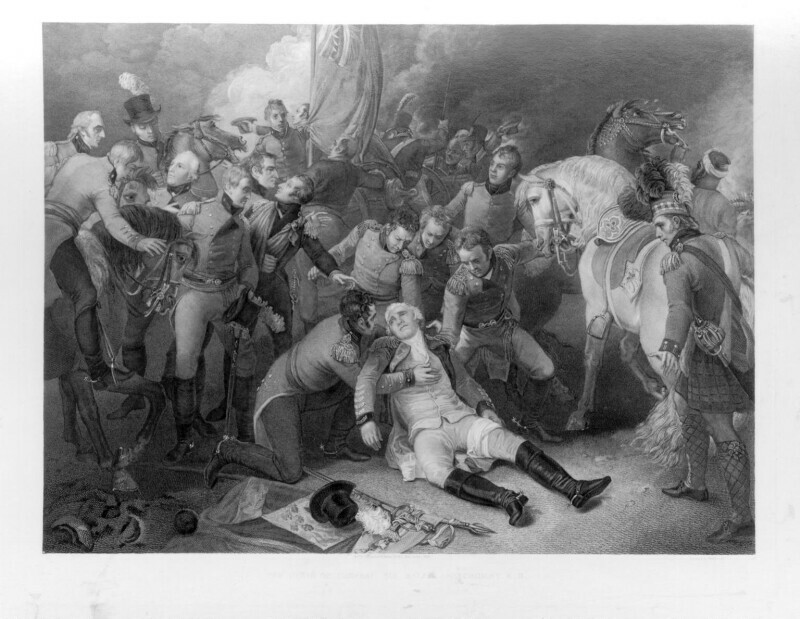 Heroic deaths in the midst of battle became a popular subject for commercial prints. Ever since the best-selling engraving after Benjamin West's The Death of General Wolfe (1771) had captured the public imagination, the demand for prints of military martyrs was insatiable. In this engraving of the death of Sir Ralph Abercromby in Egypt (1801), West's prototype was closely followed. General Abercromby collapses on the field between two of his faithful generals with the flag raised high above his head. The popularity of such prints relied on their combination of realism - in details of costume and portraiture - and idealised religious references. This engraving was so successful it was reissued in 1828, over twenty years after its first appearance.